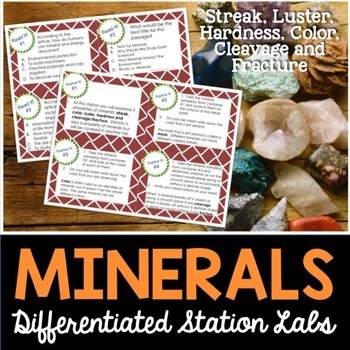 Minerals and Properties Station Lab - Students will love you for providing them with a hands-on experience when learning about the properties of minerals. The Minerals Properties station lab is a plug and play unit that is meant to accompany my FREE Mad Science Station Lab Series. Download that start-up guide to learn more about how to use it in the classroom. There are 8 total stations for the station lab (plus 2 signs for break stations if needed). Each station includes all of the signage, literature, resources, and task cards for the students to complete them independently or with a group. The Properties of Minerals lab will also require a few supplies that you likely already have in your lab (mineral samples). Explore It! – This station will be a hands-on demo or experiment that allows the student to connect the information through the application of mineral properties. Illustrate It! – This station allows the student to sketch or draw out the concept that they are learning. This allows for better recall and retention of new information. Read It! 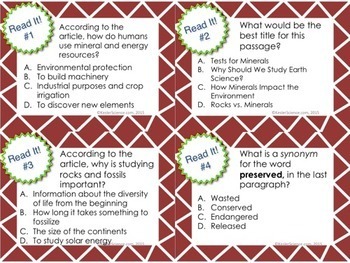 – At this station students will find a short passage relevant to rocks and minerals and have to answer 3-4 multiple choice questions about the reading. There are two reading passages: an on-level version and a modified version. Watch It! – Students will watch a short video at this station and answer questions relevant to their learning. This station can be setup with class computers/tablets, SMART board, or even a teachers computer. Organize It! 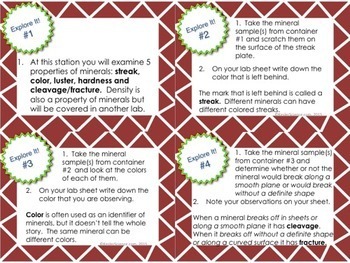 – The students will be using a manipulative to match mineral property test vs. false tests. Write It! – At this station the students will be responding to 2-4 short answer prompts that will allow them to communicate their knowledge in complete sentences. Research It! – This station will be a website that students will go to learn more information about the topic. Students will perform tasks and answer questions on their lab sheet. This station can be setup with class computers/tablets, SMART board, or even a teachers computer. If no computers are available you can double up one of the other stations and replace this module. Easy. Assess It! 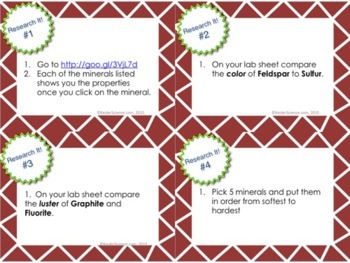 – The students will demonstrate their knowledge of the mineral properties using a series of task cards with more formal questions. Kesler Science blog for more great activities and freebies. Copyright © Chris Kesler. All rights reserved by author. This product is to be used by the original downloader only. Copying for more than one teacher, classroom, department, school, or school system is prohibited. This product may not be distributed or displayed digitally for public view. Failure to comply is a copyright infringement and a violation of the Digital Millennium Copyright Act (DMCA). Clipart and elements found in this PDF are copyrighted and cannot be extracted and used outside of this file without permission or license. Intended for classroom and personal use ONLY.